On the one hand, there’s no doubt that apps would increase access to GP services. As just one example, recent BBC analysis reveals that many citizens are still unable to access a seven-day-a-week GP service, going against promises made by the government. However, for any app to deliver true value, it must reside in and be accessed via resilient, high-speed infrastructure. After all, a smart health service is powerless without a robust network that delivers fast and reliable connectivity. There’s no doubt that we need to create a smart NHS – one that can more widely take advantage of future technologies such as AI, VR, and IoT, to name just a few. Still, if we don’t fix some of the basics, there’s a risk of creating something akin to a two-legged stool. This is why it’s so paramount to lay the right foundations: for years, the NHS has not been able to innovate, thanks largely to its network creaking under the strain. To top it off, Windows XP remains a prevalent operating system and data stays siloed, so it’s much more difficult for NHS staff to offer a genuinely holistic approach to care that meets the needs of modern patients. As long as these barriers remain, the NHS will never reap the lifesaving benefits of cutting-edge technology, because - quite simply - we can’t power the NHS into the future by continually patching Windows XP. To break free from this and embrace the future, the NHS needs to create a technical legacy by investing in multi-service, high-speed platforms that elevate all its people. This is where the power of the network becomes most apparent. It’s the very foundation of progression, because if a hospital can’t support multiple technologies - and those coming over the horizon soon such as 5G – then it will fail to engage patients. As such, it’s imperative that more attention is paid to the infrastructure that underpins them, both in terms of reliability and having a high enough capacity to deal with existing and future strain. In turn, competition in infrastructure is vital, as this is what truly optimises services; if there’s no monopoly, then it becomes compulsory to care. Ultimately, this benefits patients and NHS staff alike. The infrastructure itself can be tailor-made to a health organisation’s unique requirements. All of this accelerates innovation, helping to future-proof our globally renowned health service, free at the point of use - so long may it live, powered by technology. Afshin Attari holds an honours degree in Mechanical Engineering, a MBA gained from the Henley Management College and a MSc. in Business Telecommunications from UCL, London. 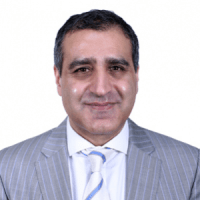 Afshin has held various senior positions within BT, its overseas joint ventures, O2 and KCOM. This has included spells in Engineering, Network Build, Business Management, Outsourcing, Sales / Marketing and Business Development. Afshin has executive responsibility for managing and growing exponential-e's Public Sector Business he SC cleared and Gold Command Trained and was the executive forward point O2 Airwave in Gold Command during the 7/7 London bombings and also the executive leading on the Hemel Hempstead Buncefield oil storage depot disaster / incident. Aside from work Afshin is married with one daughter and a keen sportsman and overseas traveller. Thursday, 23 August 2018 There’s an app for that – but is this what the NHS really needs?